Bangalore, April 13, 2017: Axilor Ventures announced the list of 20 startups that made it to its Summer’17 accelerator batch. This is its fifth batch and is the largest accelerator cohort in India. The cohort of 20 startups and 52 founders makes for interesting statistics. They belong to five sectors – consumer internet (4), enterprise (6), AI (4), healthcare (3) and fin-tech (3). 80% of them are product companies – 10 serving enterprises, 6 consumers and 4 serving healthcare providers. All but 2 have already launched and 10 of them are post revenues. The founders have diverse experience – 9 of the 52 founders are less than a year out of college (some graduating next month) to very experienced folks starting up first time. While the median years of experience is 6 years, 2 years on an average has been spent working on a problem similar to their startup idea. Interestingly, 15 out of the 20 startups are from outside of, signifying the depth of startup talent in cities like Delhi, Mumbai and Chennai. 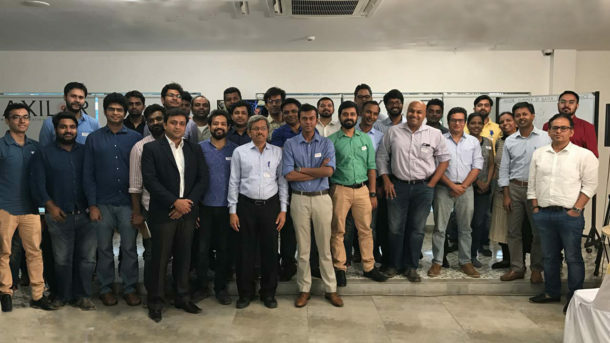 Welcoming the startups into the batch, Asutosh Upadhyay, Head of Programs at Axilor, said “The demand for our program has been overwhelming and validates the need for such programs among founders. Unlike the previous batches, most of the startups are post launch and some of them post-revenues. Our 100-day program is designed to help them make rapid progress, gain business traction and get funded. Axilor’s market network provides early access to customers and partners. They get to work with resident advisors on the riskiest parts of their business and finally get funded.” Axilor’s growing community of 100+ founders is another big draw. Being part of this community allows them to learn from other experienced founders, tap into each other’s networks and seek help. AI/ ML Detect Detect is a Drone data-as-a-service company focused on helping manufacturing industries ensure asset integrity and proactive monitoring leading to enormous cost reduction. Detect’s solution is currently in use in some of India’s largest oil & gas companies. Niramai 95% of breast cancers are curable if detected early. Yet 76,000 women die in India alone and more than 700,000 globally, every year. Niramai is working on a non-invasive, radiation-free, painless and low cost cancer screening solution. Orbuculum Genomic data holds the key to predicting health. Orbuculum uses AI on genome data to predict diseases such as cancer, diabetes and other chronic diseases. Orbuculum’s AI tool will help doctors diagnose chronic diseases early thus reducing cost and improving effectiveness. Last mile logistics is big with an estimated 2 billion+ annual deliveries by 2020 in India alone. But they are also expensive, manual and error-prone escalating costs and compromising customer experience. Transporter.city’s SaaS product automates the entire last mile logistics planning and helps increase the same day delivery output to 95% with 25% lesser delivery fleet and 40% cost savings. Enterprise Adya Inc All enterprises are prone to Cybersecurity threats – not just the ones who can afford an expensive on-premise security product. Adya’s network and endpoint cybersecurity SaaS product helps enterprises protect themselves from employee theft and ransomware – a problem affecting more than 70% of enterprises, globally. CoPro Events and business conferences are ubiquitous. But there is no tool that can assess audience engagement and generate actionable insights and analytics for the organizers. Crowd Product (CoPro) is pioneering the way audiences engage during events. Already used in leading startup events including Nasscom Product Conclave 2016, TiE Product Showcases and many more VC events. Extraaedge Student acquisition for educational institutes is highly expensive, conventional and inefficient. Extraaedge is a “Salesforce+Hubspot” for educational enterprises that generates a 3X RoI on their marketing and sales spend. Gig Production Event organisers want large audiences but struggle to manage pre-event and post-event audience engagement. Used by the likes of DJ Snake and Sunburn, Gig’s automated communication tool bridges this gap and connects concert organisers to their audience, right on Facebook messenger. Maroon Maroon is a predictive analytics platform that enables enterprise sales teams achieve upto 44% higher conversions on their marketing and sales leads. Rucept Rucept is a powerful merchandising platform for high traffic content creators globally. It helps them monetize their art and engagement through products without investing in sampling, manufacturing stocking and distribution. Fintect Healthfin Healthfin makes healthcare procedures affordable for consumers. Especially with low penetration of medical insurance, Healthfin helps patients secure credit support for expensive medical procedures. With an inventory of >4000 hospitals and 9500 diagnostic centres, HealthFin helps patients discover the best hospitals and secure funding. Legal Docs Executing legal documents, especially for consumer needs (like rental agreements, PoA registrations etc) is time consuming, expensive and is dependent on multiple parties. Legaldocs is the fastest growing, Do-It-Yourself portal that enables the entire legal process – documenting, verification, validation and online registration. Currently a partner to Govt of Maharashtra on the e-governance project, it also enables Aadhar based verification for Legal doc preparation. TaxGenie GST is coming! It brings with it a new multi-billion software market for GST compliance. Taxgenie is a platform that will help the 30million MSMEs be GST compliant and manage their businesses with just a smart phone and spreadsheets. Consumer Internet Castiko Entertainment in India is big and one of the top 5 markets globally. But casting, a critical aspect impacting the quality of production, is archaic, manual and time consuming. Castiko revolutionises how casting directors discover, audition and cast actors by bringing the entire cast recruitment workflow online. Multibashi With an average session length of more than 9 mins on the app, Multibhashi makes the experience of acquiring a new language highly realistic with audios recorded by native speakers and simulation of real life situations. YourQuote YourQuote’s mission is to make everyone quotable – by helping people capture their thoughts on mobile and broadcast their words as ‘google-able’ quotes. Currently gaining rapid traction with over 40k organic downloads and 6k+ DAUs. Healthtech PocketPill With 300k downloads and >80k MAUs, PocketPill has established the use case for solving $300 billion problem of medication non-adherence in chronic patients by bringing affordable medicine to everyone, saving costs and improving health outcomes. Talkadoc Chronic disease management is protocol-driven, time consuming and requires frequent doctor visits. In cases like mental health, with the doctor-patient ratio of 1:1100, there aren’t enough doctors. Talkadoc’s product allows doctors to increase the acceptance of new cases by at least 25%. This is achieved by helping them automate the entire patient management process. Currently focused on mental health, it is already being used by over 30 doctors and 20k patients and caregivers. Treatgo Healthcare is expensive all over the world. More than 7m people travel to other countries every year in search of cheaper and more effective treatments – 300k travel to India alone. Treatgo is an online platform to help international patients and referring doctors compare, choose and reserve medical treatments. Where Should You Invest Your hard-earned Savings?